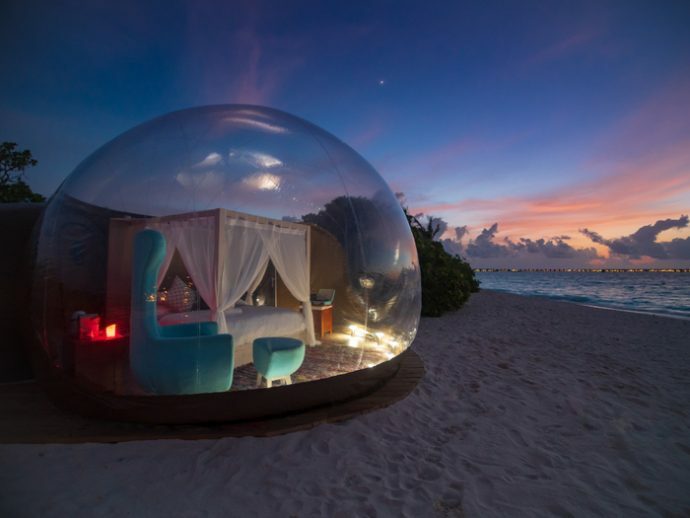 Indian Ocean’s grooviest getaway Finolhu Maldives has unveiled a stunning new ‘Beach Bubble’ tent — the first of its kind in the archipelago — on a secluded stretch of its famed Fish & Crab Shack sandbank. Conceived and custom-designed by the crazy cats at Eye In The Sky, the transparent inflatable bubble is a unique, inspiring environment where guests can enjoy an incredible, closer-to-nature experience without compromising on high-spec design and luxurious creature comforts. Constructed using super-strong, high tech polyester fabric, Eye In The Sky’s pioneering Bubble Tent provides a UV-protected, fully waterproof, climate-controlled cocoon that offers guests a uniquely immersive nature experience. The Bubble is an exclusive worldwide patented Precontraint Serge Ferrari technology and acquires distinctive properties in terms of resistance, dimensional stability and light weight, eliminating deformation due to load and offering a longer useful life. The interiors feature custom-fitted wooden floors and bespoke furnishings, and a separate adjoining bubble bathroom with WC and shower. 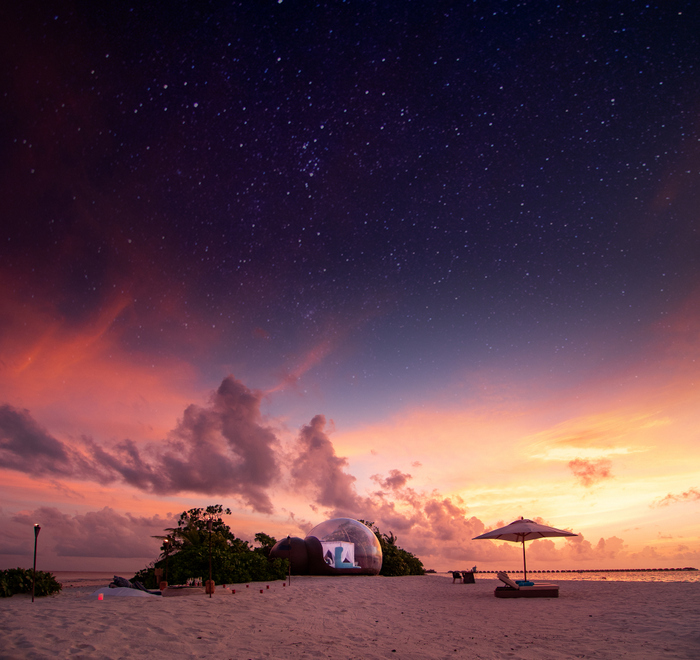 Finolhu’s exclusive ‘Dream Eclipse’ experience costs USD 600++ per couple, including one night in the Beach Bubble (sunset to sunrise, from 7pm to 9am), a private Beach BBQ, and private waterside breakfast at Bubble Beach. Located in the UNESCO world biosphere of Baa atoll, both resorts can be reached by either seaplane in just 30 minutes from Velana International Airport or by a 20-minute flight to Dharavandhoo Domestic Airport in Baa atoll followed by a short speedboat ride. TagsFinolhuSmall Maldives Island CoThe Small Maldive Island Co.The Small Maldives Island Co.